3.1 People engaging in various types of water-based activities have been involved in shark incidents, including surfers, divers, swimmers and spearfishers. Over many decades, various measures have been put in place to help protect beachgoers from the risk of encountering a dangerous shark. As visiting the beach and beach culture forms an important part of the way of life for many Australians and is a drawcard for domestic and international tourism, spikes in shark encounters can lead to calls for governments to introduce further measures to protect public safety. 3.2 In responding to the risk that people undertaking recreational ocean-based activities may encounter a dangerous shark, measures that are non-lethal to sharks are widely used. In some states, these non-lethal measures are supplemented by devices that are designed to be lethal to sharks are also deployed. This chapter provides an overview of the non-lethal and lethal measures used in Australia. 3.3 Across Australia, several types of public safety measures and programs used are non-lethal to sharks. State governments and not-for-profit organisations generally manage these measures. community awareness strategies, including websites, social media and mobile apps that disseminate shark alerts. 3.5 In addition to the measures listed above, a variety of new and emerging shark deterrent and mitigation measures are in use or under development. Evidence about the long-established measures are discussed in the following paragraphs; the new and emerging technologies are discussed in Chapter 6. The simplest and most effective safety measure that members of the general public can follow is to only swim at patrolled beaches and swim between the red and yellow flags. This is the best place to swim because lifesavers and lifeguards are able to monitor all risks to maximise the safety of swimmers. 3.7 A representative of Surf Life Saving Western Australia informed the committee that, in a two-year period, their lifesavers issued 258 direct shark warnings to beach users, which resulted in over 4,600 individuals being warned to leave the water. Overall, once information from beach patrols, aerial surveillance, shark tags and public sightings are taken into account, Western Australian lifesavers 'have cleared tens of thousands of beach users where there was an imminent threat in the water'. Evidence given to the committee indicates that the only recent instance of a death at a patrolled beach in Western Australia occurred early in the morning when lifeguards were arriving at the beach and setting up. ...the closing of a beach for a period of time with Surf Life Saving assets (helicopters, rescue craft, personnel) allocated to the area to ensure risk is minimised to the community. The water is cleared and surf lifesavers and lifeguards will monitor the area and liaise with Police as required. for beaches patrolled by Surf Life Saving NSW, a risk management approach is used that takes into account where the shark was spotted, the type of shark and who reported it. 3.10 Surf Life Saving NSW and Australian Lifeguard Service NSW advised that, at some patrolled beaches, shark alarms can be sounded to direct people to leave the water when a shark is detected. In addition, they advised that as a result of funding provided by the New South Wales Department of Primary Industries (DPI), Surf Life Saving NSW 'was able to purchase additional shark alarms in priority areas'. Previous funding also enabled Surf Life Saving NSW to ensure every surf lifesaving club in the state was provided with 'a loud hailer and water resistant binoculars'. has increased the use of watercraft prior to opening the beach and when the beach is open. 3.13 The essential work undertaken by surf lifesaving clubs across the country was acknowledged in other submissions. For example, in their joint submission, Dr Daniel Bucher and Professor Peter Harrison stated that a surf lifesaving patrolled beach is a measure that, despite being 'often overlooked', has 'resulted in zero fatalities over an extended period of time'. They added that patrolled beaches have another advantage for public safety generally in that they help prevent drownings. The biggest cost we have is volunteer time. When an attack occurs or an encounter occurs at a beach...Surf Life Saving, because of either the public's expectation or the media's expectation, the public and the media think we are in charge—which is probably a success of our brand and the role we do—but in actual fact we know we are not. So when we get tasked to an incident—the latest attack was, I think, in Forster, at a very remote beach—the expectation is that Surf Life Saving will respond and man the beaches and put up signs everywhere. The reality is that we do not have the resources to do that. We have seen people come down and want to participate in events and they are unable to or been halfway through an event and participation has had to stop. People become very frustrated and become very angry by that. If I look at the Clever Buoy example at City Beach where that trial was conducted and the number of beach closures, there was a significant amount of angst from the people and that anger was directed at the lifesavers, who were simply delivering the protocols and closing the beach. In that sense, that is disappointing. Where am I going to go for a surf? Am I going to surf between the flags or am I going to surf where it's really cracking hot? 3.17 The committee received evidence about aerial patrols of the coastline conducted by fixed wing aircraft and helicopters. It was advised that four aerial patrols dedicated to bather protection currently operate in Australia. 3.18 The Government of South Australia advised that both fixed wing and rotary wing patrols are used in its jurisdiction. The government's submission, which was provided in March 2017, noted that in 2016–17 fixed wing aircraft are expected to have conducted 1060 hours of regular coastal surveillance in two areas: from the northern Adelaide suburbs to Rapid Bay; and from Victor Harbor to the mouth of the Murray River. The aircrafts use at least three personnel, allowing two dedicated observers 'to concentrate on maintaining watch and managing/communicating any sightings'. 3.19 The helicopter patrols are limited to supporting open water aquatic events in the Adelaide metropolitan beaches and the south coast. These patrols are conducted by the Westpac Life Saver Rescue Helicopter (as part of an arrangement with Surf Life Saving SA). Although these patrols are limited in number (18 patrols were undertaken in 2016–17), the government noted that this approach has the additional advantage in that 'the helicopter can be used to actively drive large sharks away from the shore to reduce the immediate risk of interactions with members of the public'. 3.20 The committee also received evidence from the Australian Aerial Patrol, which was formed in 1957. The registered charity patrols part of the New South Wales south coast from southern Sydney to Mollymook. 3.21 Australian Aerial Patrol explained that when a shark is spotted and logged, if swimmers or surfers are nearby a siren and loudspeaker on the aircraft is used to alert them. For beaches with professional or volunteer lifeguards, the spotting can be reported to these lifeguards for further action. In response to sightings of large sharks, Mr Duncan Leadbitter, Director, Australian Aerial Patrol, added that the aircraft conduct orbits to deter the shark until it has swum away or people have left the water. On one occasion when people would not get out of the water we called the Federal Police, because it was in Jervis Bay waters, to get somebody down because there were small children with a large shark nearby. That is unusual but shark attacks are not usual anyway. 3.23 An advantage of aerial patrols is that they can cover unpatrolled beaches; for example, Mr Leadbitter observed that 'south of Kiama there are very few patrolled beaches...we very commonly see people surfing or swimming in areas which are a long, long way from the patrolled areas'. Nonetheless, as noted above, aerial patrols can still support public safety efforts at patrolled beaches. Mr Leadbitter stated that the good record of no fatalities between the flags at patrolled beaches 'is why we work in tandem with the beach safety providers'. ...I can tell you there is nothing more reassuring as seeing a helicopter fly over where you are surfing and not stop & hover above you. I was involved in a surf break evacuation in Dec 2016 when the helicopter hovered above us and then gave the alarm of a shark very close by. People want to feel safe at the beach, and they equate the aerial patrol with somebody looking after them. The risk of shark attack is virtually negligible. You really need to get people over the fear. They like to see the planes. It is very simple. 3.26 However, the committee also received evidence arguing that the effectiveness of aerial beach patrols is limited. The Queensland Department of Agriculture and Fisheries referred to an assessment of New South Wales aerial patrols, which 'confirmed that sighting sharks is very difficult from the air', with an overall sighting rate of 17 per cent. The department noted that this 'suggests sharks sighted from aircraft observers can be missed if the water depth is too deep or turbid'. In addition, species of sharks that are known to be potentially dangerous to humans (white, tiger and bull sharks) 'may be near the surf break before being detectable aerially'. 3.27 Similarly, Dr Christopher Neff submitted that the use of aerial surveillance depends on weather conditions, and that 'cloud cover, white caps, sun glare, the type of shark, position of the shark, and size of shark can all affect visibility'. 3.28 Overall, the committee heard divergent views on the utility and future of aerial patrols. Australian Aerial Patrol argued that aerial patrols 'are no less effective at protecting beach goers than other established methods', and called for the Australian Government to investigate the creation of aerial patrols elsewhere in Australia. However, Associate Professor Daryl McPhee expressed the view that '[t]he traditional approach of using people in planes and helicopters to spot sharks is outdated, and will more than likely be replaced with other technologies such as drones'. 3.29 Stakeholder views on the potential for unmanned aerial vehicles to be widely used for shark spotting are discussed in Chapter 6. 3.30 There are many techniques used to convey information to the public about the risks presented by sharks. This section briefly discusses some of the mechanisms used. Additional proposals to raise awareness and improve the public's understanding of how to keep safe are discussed in Chapters 6 and 7. 3.31 One of the most visible methods is the use of signs at beaches and other waterways to warn about the risk of sharks. For example, temporary signs can be used when a beach is closed because of a shark sighting or to warn of recent sightings. 3.32 Public information campaigns have been developed to inform the public about the risk associated with sharks. For example, Surf Life Saving NSW and Australian Lifeguard Service NSW advised that, in 2015, DPI initiated a state-wide information campaign known as 'SmarkSmart'. The campaign, which was supported by Surf Life Saving NSW, aimed to 'help the general public be aware of how they can minimize the risk of being in waters where sharks may be present'. Information containing safety tips and advice was distributed to surf lifesaving clubs and coastal accommodation providers in northern New South Wales. 3.33 Separately to the SharkSmart program, Surf Life Saving NSW advised that it has introduced a coastal accommodation network e-newsletter that includes 'surf safety resources and information on safety signs so guests are "beach ready" and know what the different warning signs mean'. Some editions of the newsletter have also contained 'shark management stories' intended to promote awareness. There is information available on the website in 30 languages and the website can direct swimmers to the nearest patrolled beach. Visitors to the website can view fact sheets on rips, bluebottles and other hazards in different languages. Visitors can also download the Beachsafe App on their smartphones, which provides access to patrol locations and hours; and real-time weather and surf conditions, anywhere along the coast. 3.35 As part of the New South Wales SmarkSmart campaign, a SharkSmart mobile app was developed and released. The app provides information and resources to help reduce the risk of shark encounters. Since March 2016, the app has provided users with real-time alerts if a shark tagged with a tracking device (this is discussed in Chapter 6) is near a listening station or if a shark incident recently occurred in the area. This information is also distributed via Twitter. The SmarkSmart website/app is recognised by Surf Life Saving New South Wales as a source of reliable information about shark sightings. 3.36 In Western Australia, the state government operates a SharkSmart public education website (www.sharksmart.com.au). In addition to information to help members of the public to minimise the risk of encountering a shark, the website provides details on shark sightings, including tagged sharks detected by listening stations, sharks spotted by the Westpac Lifesaver Rescue Helicopter Service and shark sightings reported by members of the public. Surf Lifesaving Western Australia also distributes information about shark sightings via Twitter; its account has over 46,000 followers. Mr Chris Peck from Surf Life Saving Western Australia described the Twitter account as being 'critical...for locations where patrols or other initiatives are infrequent or not present at all'. 3.37 Some of the positive and negative issues regarding the use of social media to distribute information about sharks spotted were discussed in Chapter 2. 3.38 Much of the evidence received by the committee on government responses to shark incidents focused on the lethal measures used in Queensland and New South Wales for decades, as well as the measures more recently used in Western Australia. the catch rates and bycatch associated with the use of lethal measures. 3.40 The effectiveness of the lethal shark control measures used in Australia is an issue that attracted significant comment and, accordingly, is discussed in a dedicated chapter (Chapter 4). 3.41 The two lethal shark measures examined in detail during this inquiry are shark nets (also referred to as shark meshing) and drum lines. 3.42 Shark nets designed to entangle large sharks have been used in Australia for decades. The general goal of nets is to 'reduce the number of potentially dangerous sharks in particular areas rather than [to] create an impenetrable barrier against shark attack'. That is, the nets do not create an enclosed area that separates bathers from sharks. Rather, the nets are designed 'to catch "resident sharks" and sharks that move through an area while feeding on bait fish'. The nets feature acoustic warning devices intended to alert dolphins and whales. The nets are bottom-set on bare sand and held in position using sand anchors weighing between 27 and 30 kg. 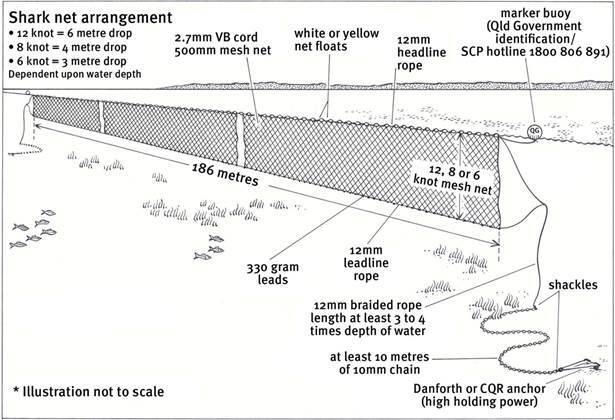 Nets are required to be set parallel to the beach in waters 10 to 12 m deep (i.e. about 4–6 m below the surface), which generally corresponds to a distance of within 500 m of the beach. This configuration for a net is referred to as a 'set'...although two nets can be set simultaneously to constitute two sets for that beach. The location of a set is determined by the prevailing and forecast wind, seas and currents, but is usually adjacent to the surf clubs and patrolled swimming areas. 3.44 A depiction of a net in operation under the New South Wales north coast trial is at Figure 3.1. In Queensland, the nets are surface-set. 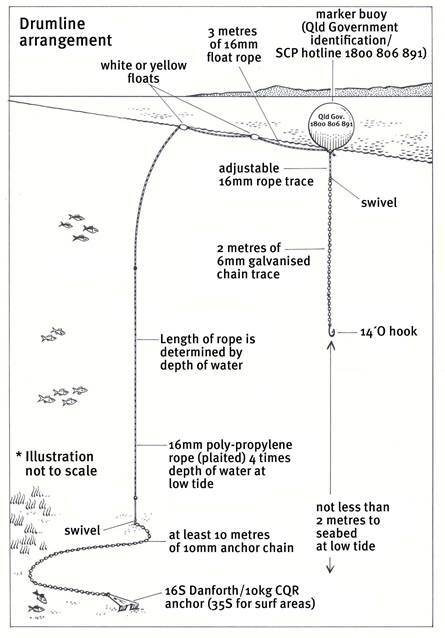 An illustration of how shark nets are deployed, based on the Queensland arrangements, is at Figure 3.2. Source: DPI, 'Shark nets for the NSW North Coast', www.dpi.nsw.gov.au/__data/assets/pdf_file/0005/681953‌/20161207-Shark-Trial-Fact-Sheet-.pdf (accessed 9 February 2017). Source: Queensland Department of Agriculture and Fisheries, Submission 32, p. 9. 3.45 The nets incur damage during the meshing season. For example, the 2015–16 performance report on the New South Wales program stated that a net was reported missing after a storm event, some nets were believed to be damaged by anchors or entangled after an interaction with a vessel, and others were vandalised. Other damage was also reported, such as nets that were slashed or instances were lines were cut, however, reasons for the damage were not given. 3.46 Drum lines use baited hooks to capture actively feeding sharks. The hook is suspended from a plastic float that is anchored to the seabed. Figure 3.3 provides an illustration of how a drum line is set. Source: Queensland Department of Agriculture and Fisheries, Submission 32, p. 10. White, tiger or bull sharks 300 cm Total Length...or greater captured on these drum lines will be destroyed by the contractor using a firearm. Any other captured animals that are not considered to be in a condition to survive will also be destroyed. Deceased sharks (whether destroyed or killed by their capture) will be fitted with uniquely-identified disposal tags and removed to a specified distance offshore and discarded or, where practical, retained for scientific study. Captured animals that are considered to have a chance of survival will be released as swiftly and carefully as possible after measurement and other basic data are recorded. 3.48 Drum lines that are not intended to kill sharks, but to alert a response team, are in use in New South Wales. These are known as Shark Management Alert in Real Time (SMART) drum lines and are discussed as a new and emerging measure in Chapter 6. 3.49 The following paragraphs outline state government programs in place that involve lethal measures for reducing the risk of shark encounters. 3.50 A shark meshing program was introduced in New South Wales in 1937. At present, 51 ocean beaches from Wollongong to Newcastle are netted between 1 September and 30 April each year using sunk nets fitted with acoustic warning devices to alert dolphins and whales. As noted above, the New South Wales Government also uses SMART drum lines, which are discussed in the section on new and emerging technologies in Chapter 6. 3.51 In addition to the long-established measures in place in some parts of New South Wales, in recent years the state government has responded to a spike in shark incidents, including fatalities, with an overarching shark management strategy and trials of both new technologies and lethal measures in other areas. ...since 1 January 2014 there have been 41 interactions with sharks in NSW waters. Of these, 27 were unprovoked , with three resulting in fatalities (one surfer, two ocean swimmers), the most of which occurred in February 2015 in Ballina on the NSW North Coast. Of the remaining 24 interactions, six resulted in serious injuries, 11 in minor injuries and seven with no injuries...Of those 27 unprovoked shark interactions, 14 occurred on the Far North Coast, five in the Mid North Coast, two in the Hunter, one each in the Central Coast, Sydney, and Illawarra and three on the South Coast. 3.53 In October 2015, the New South Wales Government released the NSW Shark Management Strategy. The Strategy has three elements: surveillance, detection and deterrence; science and research; and education and community awareness. In total, $16 million was allocated to trials of new technologies, aerial and coastal surveillance, additional research including an expansion of a shark tagging program, and programs intended to improve community education about sharks. 3.54 In response to the spike in shark encounters on the New South Wales north coast, in October 2016 the New South Wales Government announced that it would seek to trial shark meshing on the north coast. On 10 November 2016, the New South Wales Government applied to exempt the north coast shark meshing trial from the requirement to undergo assessment under the Environment Protection and Biodiversity Conservation Act 1999 (EPBC Act). The Minister for the Environment and Energy, the Hon Josh Frydenberg MP, provided an exemption under section 158 of the EPBC Act on 16 November 2016 for a 12‑month trial (with mesh nets allowed to operate for up to six months during this period). 3.55 In September 2017, the New South Wales Government announced that it intended to conduct a second shark net trial for the north coast as further data was required 'in order to make a long-term decision on the future of the nets'. On 26 October 2017, the Minister for the Environment and Energy granted a further exemption under section 158 of the EPBC Act for the New South Wales Government to conduct shark net trials over two years from 1 November 2017. 3.56 The use of section 158 exemption for lethal shark control programs is examined in detail in Chapter 5. 3.57 Queensland has maintained a shark control program since 1962. The current program uses nets and baited drum lines to protect 85 beaches in the state. The purpose of the program is 'to reduce the possibility of shark attacks on humans in coastal waters of the state adjacent to popular coastal beaches used for bathing'. The Queensland Department of Agriculture and Fisheries submitted that the combination of apparatus used accounts for drum lines being effective at catching tiger sharks, while nets are more effective for catching bull sharks. 3.58 The number of sharks caught under the shark control program between 2010 and 2016 is at Table 3.1. Most sharks are killed; for example, of the 531 sharks caught in 2016, government statistics indicate that only 24 were released alive. Further information about catch rates and bycatch is provided in the next chapter. Source: Queensland Department of Agriculture and Fisheries, 'Queensland shark control program catch statistics 2001–December 2016' https://data.qld.gov.au/dataset/shark-control-program-shark-catch-statistics/resource/5c6‌be990-3938-4125-8cca-dac0cd734263 (accessed 30 January 2017). 3.59 The Western Australian Government has had a shark hazard mitigation strategy in place since 2008. The strategy commenced with aerial and beach patrols, with funding subsequently provided for 'research, shark tagging and tracking, an imminent threat policy to fish for a shark, a beach enclosure trial, and development of a Beachsafe app'. 3.60 In December 2013, the Western Australian Government announced that baited drum lines would be set at eight locations in the state. The drum lines were designed to catch large sharks. Sharks deemed to be a threat to water users would be destroyed. 3.61 The Western Australian Government applied to the then Minister for the Environment, the Hon Greg Hunt MP, for an exemption under section 158 of the EPBC Act for up to 72 baited drum lines. An exemption was granted on 10 January 2014 until 30 April 2014. 3.62 The Western Australian Government subsequently proposed that the drum line program would continue for three additional summer seasons, which resulted in the Western Australian Environmental Protection Authority (EPA) initiating a public environmental review process to meet EPBC Act and state requirements for environmental assessment and approval of the program. After considering the environment impacts of the proposal, the EPA announced on 11 September 2014 that it had recommended the proposal should not be implemented. 3.63 The Western Australian Government withdrew the proposal from the EPBC Act assessment process in October 2014. 3.64 Since the EPA's decision, the Western Australian Government has further developed its shark hazard mitigation strategy by adding beach enclosures, extending aerial patrols, updating guidelines for taking sharks posing a serious threat to public safety, and installing watchtowers at Cottesloe Beach. In addition, the government may order that capture gear be set to take a shark posing a serious threat to public safety. funding for Surf Life Saving WA to use drones to monitor beaches, two additional receivers to detect tagged sharks and funding for an additional beach enclosure (these technologies and measures are discussed in Chapter 6). 3.66 As mesh nets are a passive fishing activity that is not selective, a wide range of non‑target species is caught (these may include rays, dugongs, turtles, fish, cetaceans and grey nurse sharks). Although drum lines catch lower numbers of non‑target marine species, advice to the Minister for the Environment from 2005 indicates that large numbers of marine turtles are caught on drum lines. Between 1975 and 2001, 11,899 sharks, including white sharks, tiger sharks and bull sharks, were killed in nets and drum lines, and over this same period 53,000 other marine animals were killed. Nets and drum lines are also a major contributor to the severe decline of species such as the protected dugong and the grey nurse shark. This is a critically endangered species which is still being captured and killed in numbers too great to sustain the population. 3.68 During the Western Australian drum line trial, 172 sharks were caught. Of these, 163 were tiger sharks, of which 64 were killed (either found dead upon gear retrieval or destroyed). No white sharks were caught. Recorded bycatch during the Western Australian trial comprised nine sharks of non-target species, seven rays and one north-west blowfish. 3.69 During the 2015–16 meshing season in New South Wales, the shark meshing program resulted in 748 marine life interactions (133 interactions with target sharks and 615 interactions with non-target marine life). Of these animals, 51 per cent were released alive. The 2015–16 statistics represent a significant increase on 2014–15, when 189 marine life interactions were reported, including 145 interactions with non‑target marine life. 3.70 Over the course of the New South Wales north coast trial of nets conducted between 8 December 2016 to 30 May 2017, 275 animals were caught. Of these, three white sharks, three tiger sharks and three bull sharks were caught. That is, target sharks were three per cent of the total catch. The overall survival rate of all animals caught was 47 per cent. 3.71 As noted above, under the Queensland program 531 sharks were caught in 2016, of which 24 are recorded as being released alive. Bycatch of 55 non-target species were recorded (ether deceased or released alive). Information published about the Queensland shark control program states that bycatch levels 'are carefully monitored and research is focused on minimising impacts on non-target species'. 3.72 To mitigate bycatch quantities, the Queensland program also seeks to use drum lines instead of nets 'when possible'. The Queensland department advised that in July 2013, the nets used at Cairns were replaced by drum lines to reduce the bycatch of non-target marine animals. The department advised that since this change was made 'there have been zero non-target animals caught in Cairns equipment'. It is also intended that other nets in the Great Barrier Reef Marine Park will be permanently replaced with drum lines, resulting in 'the Great Barrier Reef Marine Park being free from shark nets'. Nets used in Queensland are also surface-set to reduce the amount of bycatch. 3.73 In addition, the committee was advised that advances in acoustic alarm technology has resulted in reductions in bycatch of certain marine mammals. In May 2014, all nets used in the program 'were fitted with a new type of acoustic alarm, which has assisted in a gradual reduction in the number of dolphins caught in the following years'. moving nets away from certain areas where the concentration on non-target animals is known to be high. There are separate datasets. The way EPA sources some of the incidents is obviously through fisheries but there is also overlap data within the EPA dataset that has to be continuously cleared. I am also aware of incidents that are not being reported, in particular the ones that are near misses, so animals that free themselves. We had at least another three of them in the last two to three weeks on the Gold Coast, so animals do get entangled. There might be even a call-out for rescue but then the animals free themselves. I consider them actually as an incident because we do not know if the animals are injured or stressed and what the long-term impact is. If we are looking at numbers from last year, we can probably talk about 14 entanglements whereas six are properly recorded as entanglements because they had to be freed. 3.76 Stakeholder views on the lethal measures, including the catch rates and amounts of bycatch, are discussed in the following chapter.